I’m reblogging a post today from our blogger friend Divya. Her blog is http://divyaadusumilli.wordpress.com and I encourage you to go visit. It is a wonderful blog. Last week she contacted me and my wife, Mary, http://thebackdoorartist.com/ about drawing a picture from a photo I took of two of our golden retrievers. This is her post of our dogs. Thank you Divya, we love the picture. What a beautiful gift you have given us. Blaze and Hunter were the dogs that appeared in the original post, https://theforesterartist.com/2012/08/25/blaze/. Some of you might recognize these innocent faces in a photo taken by The Forester Artist. This is an attempt to replicate in my drawing book the pets of the Livingstons, The Forester Artist and The Backdoor Artist, who have kindly given me the permission to sketch and post publicly. I am very inspired by how real life images are the subject matter of Tim and Mary‘s illustrations, and you can find some in FireStorm in the Forest by Red Tail Publishing. They are very helpful and I am greatly delighted to have them as blogger friends (and the first ones on WordPress). 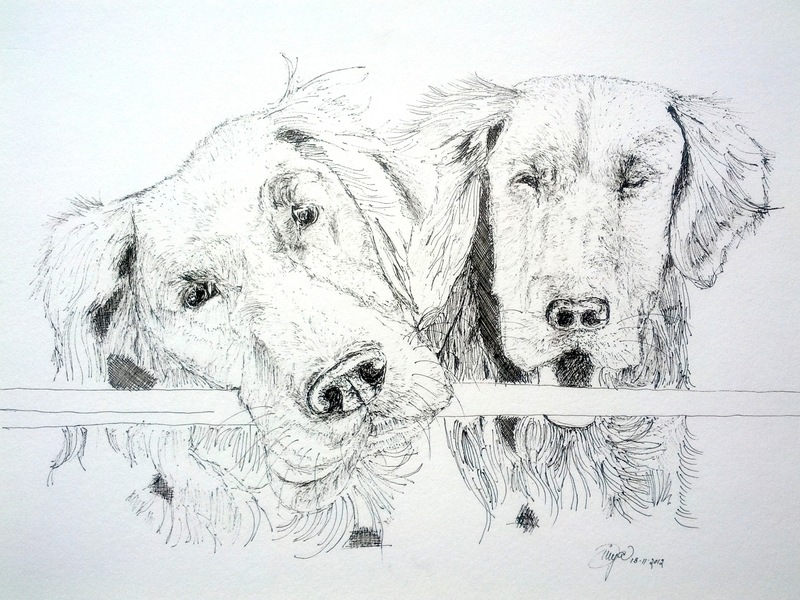 This entry was posted in Drawing, Traveling Companions and tagged art, artist, Blitz, dogs, gift, golden, golden retriever, Pencil by foresterartist. Bookmark the permalink. What a lovely portrait of your two kids. She captured the essence of dog. It has a good sense of humor too. Love the attentive look on their faces. Gorgeous drawing, she captured the essence of your goldens. Divya did a beautiful job. I love the quizzical look of the one on the left. Very nice.